Earlier this month, Schlafly released a mix pack of stouts that scream “drink me while sitting on Santa’s lap.” The Oatmeal Stout is the baseline in the pack, and it just gets odd from there, with a Salted Caramel Stout, Blueberry Coffee Stout and the Mexican Style Chocolate Stout. A 12 pack of Dogfish IPAs? It truly is Christmas! You get four different beers in here, the Sixty One (a mix of 60 Minute with Syrah grapes), 60 Minute, 90 Minute, and Indian Brown Dark IPA. Okay, this one is indulging in a bit of nostalgia for me. Sam Adams’ Winter Lager was the first winter seasonal I ever had. I fell in love with it and I still crave it every time I see Christmas lights in my neighborhood. Also in there are the Old Fezziwig Ale, Chocolate Bock and two new beers, an Amber Bock and Oatmeal Stout. Uinta understands that winter isn’t just about cinnamon spice and chocolate stouts, so their mix pack has 801, an easy-drinking pilsner perfect for apres ski sessions; Wyld, a session pale ale dry hopped with Simcoe; and Season Pass, a vanilla porter that satisfies your holiday sweet tooth. Flying Dog shows off its range in this holiday pack, giving you bottles of a Chocolate Milk Stout, Caramel Lager and the X-Mas Day IPA, which is an aggressively tropical IPA. This box of winter beer sets the standard for boxes of winter beer. In their infinite wisdom, Sierra Nevada gives you their Pale Ale as a baseline, then moves on to their impeccable Coffee Stout, their caramel and spice Wintertide Ale and finishes with the brand new Holidays Haze IPA. With the shopping days countdown, and magical elves on the shelves and extended mall hours, it can be easy to lose sight of the true meaning of the holidays. The holidays aren’t about buying things for each other and tricking your kids into behaving for a month. 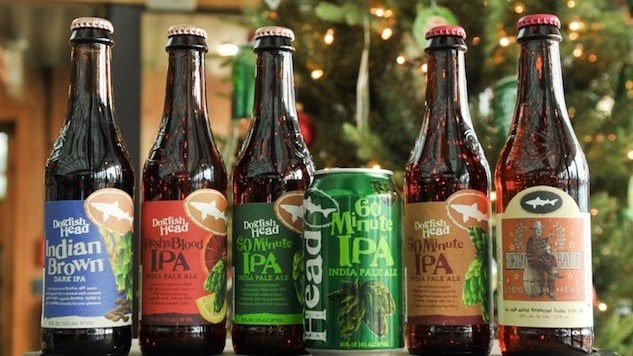 The holidays are about drinking seasonal beer that is only available for a few short weeks in the winter. To help you bring a bit of wholesome tradition back into your holidays, we’ve picked our favorite craft beer winter mix packs. We’ve found that all of these beers pair quite well with the pink bunny suit your Aunt Clara sewed you for Christmas.